OUR PEOPLE ARE OUR GREATEST ASSET; THEY BRING WITH THEM THEIR INDIVIDUALITY, PASSIONS AND DRIVE. FOR US, THE MEASURE OF OUR SUCCESS IS THE STRENGTH OF THE RELATIONSHIPS WE BUILD AND THE QUALITY OF THE PEOPLE WE ATTRACT AND RETAIN. 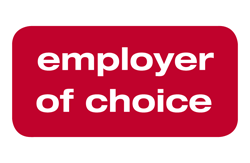 Our staff and the Tasmanian Government have recognised us an Employer of Choice since 2011, for demonstrating “contemporary workplace practices and outstanding support for our staff”. The award acknowledges the focus we have on creating a fantastic workplace, and our ability to attract and retain excellent employees. It recognises Synectic as a great place to work. We attract people who strive for success. But we want them to enjoy doing a variety of things they love. We know our people have different needs and aim to help everyone find the right balance in their work, family, academic and lifestyle pursuits. We understand there are many different ways to work effectively, and support various arrangements that recognise individual circumstances. While we’re small enough to offer a great team culture, we’re large enough to expose you to a wide variety of interesting work. We enjoy a well-established and loyal client base as well as rapid growth from new clients. You will gain experience with a diverse client base, varying in both size and complexity, including some of Tasmania’s largest and most well-known businesses. Our investment in training and development is well above industry benchmark. We encourage our people to continually develop and to be leaders in their field. By joining us, you will be mentored by inspiring leaders and work closely with senior managers and directors from day one. Client contact will occur from an early stage in your career, allowing you to quickly form your independence and manage your own client base. We are leaders in our industry, with people and resources second to none. We implement best practice systems and processes and empower our people to create success. Our leaders lead by examples of excellence and support our people to also be leaders in their profession. The beauty of working for Synectic is that, while we’re big enough to offer an interesting and challenging workplace, our team focus allows us to have fun with the people we work with. We foster a culture that focuses on enjoying what we do and creating plenty of opportunities to get together. Okay, we like to get paid too! We reward our people with appealing financial rewards, which are frequently reviewed to make sure they’re up-to-date and meet our peoples’ expectations. These include above average salaries, staff incentive scheme and study support. Our purpose is to enhance the prosperity of our people, clients and community. To be successful and enjoy yourself with us you will need to be exceptionally motivated and passionate about service excellence. You will relish challenges and have a strong drive to be at the leading edge of your profession. Work with some of Tasmania’s most successful businesses, family groups and high-net-worth individuals. Join a team where your individuality and contributions are valued. Progress your career with individual mentoring and a focus on supporting personal growth. Enjoy close involvement with clients and an emphasis on advisory services that really make a difference. We are looking for a professional Client Services Administrator to join our Financial Planning team in Devonport. Are you great at supporting your team and enjoy client contact too? If that sounds like you, check out our Seek ad for the details and to apply. We currently have no other active positions vacant. However, we are always interested to hear from people whose values and expertise align with ours. Please share your resume highlights and three reasons why you would be a great asset to our team. Contact us today to learn more about joining the Synectic team.